While there were earlier recipes for quarter inch potato slices or shavings (cut 'round and round' the potato) fried until crisp then salted (Kitchiner, Apicius Redivivus, or Cook's Oracle, 1817) , George Crum (c1828-1914) has been credited with creating the chips in 1853. 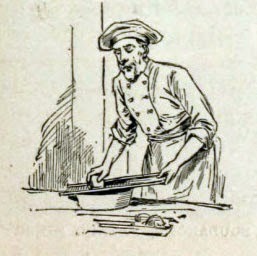 One of the earliest mentions was an 1891 article about his restaurant, below. Some recent research questions the story (even on wiki) and the link at the end of this post. Potatoes sliced thick are not Saratogas though generally so called. The true chips are as thin as paper and curl up when fried. They are used cold as well as hot, and may be prepared before wanted and kept a considerable time. It is necessary to have clean fresh lard and potatoes of good quality to get Saratoga chips of good color and the proper crispness. They should be put in before the lard gets very hot, have time to dry out in it, and when yellow should be drained in a colander, set in a pan and salt sprinkled over. Pare and slice thin eight white potatoes with a vegetable slicer. Let them soak about an hour in a pan of iced water, the colder the better. Drain and dry them on a cloth. Fry a small handful at a time in about three pints of hot lard in a deep kettle, stirring them constantly with a long-handled skimmer until they are crisp; then take them out, and sprinkle them with salt. In winter and spring, when the potatoes are old, it will be necessary to soak them in water for half a day. The Chips that follow do not belong to the vegetable kingdom, and therefore could not be very well sliced by a “vegetable slicer,” but they should have been simmered and skimmered until they were dry and crisp, and liberally sprinkled with chloride of sodium. That will give them a flavor which is designed to create an appetite for them, which cannot be satisfied by them. The more you have of them, the more you will want of them. The young man who was told by the doctor that he must live on plainer food, asked him if he would consider Saratoga chips plane-er food? The Gripsack. May 1889. Saint John, N. B.
SARATOGA Chips. Your blog title is wrong. Saratoga's in New York State. Sarasota's in Florida. Great post on potato chip cutters. Thanks for the share.